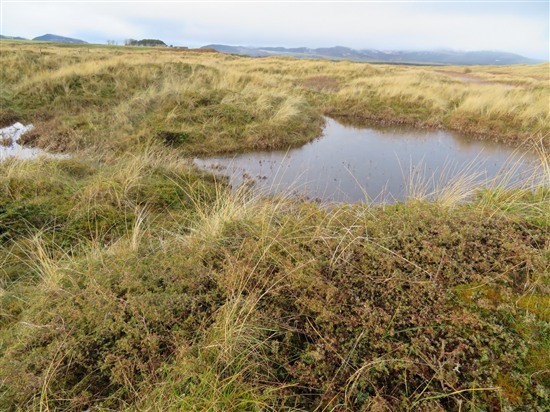 Last year proposals emerged to build a golf course at Coul Links, an area of rare dune habitats on the East Sutherland coast, home to a vast array of wildlife which is triple protected at the national, European and international levels. We’re part of a group of environmental organisations campaigning to save the site and in autumn 2017 we asked you to support us by submitting objections to the Highland Council. Now Kate Bellew, our Senior Conservation Planner, gives us an update on what’s been happening with the proposals and our campaign. Although spring has officially arrived there are still signs of winter at Coul Links. The dune slacks, which provide an important wetland habitat for many species are still flooded and many of the birds that winter here are still around. Worryingly, areas such as the one here in the photo will be lost if the proposal for a luxury golf course goes ahead. The proposals at Coul Links have often been compared to the controversial Trump golf development, which was widely criticised for its damage to protected dune habitats, designated as a nationally important Site of Special Scientific Interest (SSSI). However, it is important to note that, due to its European and international importance, Coul Links is also designated as a Special Protection Area (SPA) and a Ramsar wetland site. The dune slack habitats at Coul Links form an important part of the Ramsar site designation. Image of a dune slack - located on the proposed fairway of hole 16. Image courtesy of Tom Dargie, Not Coul. The initial formal consultation period to the planning application ended in late December 2017 with an incredible number of objections submitted – over 1000! One petition against the development now has over 85,000 signatures! This overwhelming response shows the scale of concern many people have about the environmental damage that could be caused should the plans get the go-ahead. Reading through the passionate responses from individuals and environmental groups who have taken the time to write lengthy objection letters is truly heart-warming. The responses highlight the broad range of wildlife interests that would be affected by these alarming proposals, with objections including the IUCN World Commission on Protected Areas, the National Trust for Scotland, Plantlife Scotland, Buglife Scotland, International Otter Survival Fund, Botanical Society of Britain & Ireland, the Scottish Wildlife Trust, the Dipterists Forum, the Malloch Society, Butterfly Conservation Scotland, the Scottish Tree Trust, the Tain and District Field Club, The Botanical Society of Scotland, and many more, including a number of professional ecologists and a local campaign group Not Coul. At the end of February we were notified about some additional information submitted by the developers. We were surprised to then see yet more information submitted only a few weeks later. This will be the third time that the planning application has had to be re-advertised by the Council. The huge volume of documents now available on the Highland Council’s website reflects the sensitivity of the site and the intense scrutiny this extremely complex case is under, something which the developers clearly underestimated in their initial submission. SEPA, in their role as statutory consultees in the planning system, provide advice to planning authorities on issues such as the protection of the water environment. SEPA have now responded to the additional environmental information and have withdrawn their objection. This is disappointing, particularly as their advice highlights that, even with mitigation, significant risks to sensitive habitats remain. However, SEPA have made it clear in their advice that Scottish Natural Heritage is the statutory nature conservation agency responsible for advising on the designated site implications. SNH play an important role in the planning system. As the guardians for nature conservation in Scotland, SNH provide advice on natural heritage issues to ensure that good development happens in the right places. The triple-level of protection given to Coul Links makes it among the most highly protected wildlife sites in Scotland. The Secretariat of the Ramsar Convention will be watching closely as the application progresses, to make sure that Scotland and the UK maintain their international obligations to protect this important wetland habitat. The consideration of this Ramsar site is becoming an important test case for Scotland to demonstrate its commitment to upholding international environmental agreements. The outcome will be indicative of how serious the Scottish Government are about their pledge to maintaining high environmental standards regardless of the outcome of Brexit. We hope SNH maintain their objection to ensure Scotland’s reputation as a global environmental leader can be retained. RSPB Scotland will be responding to the further information in due course. Our initial review however suggests that the impacts are still completely unacceptable. The proposals will destroy part of a site that is of national, international and European importance for wildlife. The sensitive dune slack habitats that would be lost by this development have taken thousands of years to form. We do not believe that this environmental damage can be justified or compensated. If you are concerned about the proposals, there is still time to add your voice. Back when the proposals were first submitted to the council we wrote this blog with details of how you can help and there's still time for you to do so by following the details set out in the blog. Keep an eye out for further updates and other ways you can help save this outstanding place for nature.